Teresa Biggs, AP, DOM, is a Board Certified Acupuncture Physician and Doctor of Oriental Medicine. Teresa has completed her yoga training with internationally-acclaimed yoga teacher Tiffany Cruikshank & Yoga Medicine. In 2016, she completed her RYT-200 with Tiffany & Yoga Medicine & is currently in the process of completing her RYT-500 with Yoga Medicine. 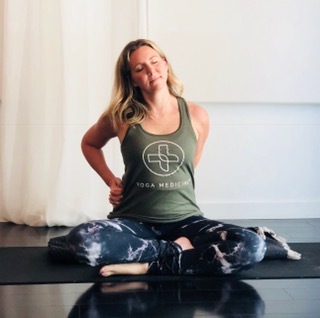 Teresa views yoga as a platform to fuse together her knowledge as a physician with her passions of: anatomy, physiology, Traditional Chinese Medicine (TCM), & the interconnection of the mind, body, and spirit. Her teaching combines these aspects to empower her patients/students to connect within through body & breath awareness for whole-body balance & wellness. Teresa teaches regular classes and workshops in her local community; as well as, teaching the Florida Gulf Coast University Women’s Tennis Team. She serves the international community by assisting Yoga Medicine Advanced Teacher Training’s and writing for Yoga Journal. Teresa also facilitates Yoga Retreats.